Why choose an "FSC® Certified Printer"
Clients often ask us about FSC® printing – that is – what is it, how it works, the benefits and the associated costs. 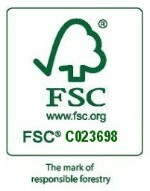 FSC stands for “Forest Stewardship Council®”. FSC is an independent organization that promotes responsible forestry. The symbol you often see on printed items is an indicator of the type of paper as well as the process used to print that piece. Not all FSC papers are recycled. Some papers are “virgin fibers” from a well-managed forest. Many papers are mixed sources. The certified FSC printer is annually certified to have processes that ensure the proper chain of custody for paper products used, and that assures the content meets the specification associated with the mark. The FSC printing process is NOT more expensive than using a non-FSC certified printer. However, sometimes the papers can be more expensive than other choices. So why use an FSC printer & paper? Well, to many, the environmental statement is an important marketing statement. Just as many companies choose to use recycled products, reduce their waste and be more energy efficient, they also choose to tell the customer about this purposeful decision. Clients should decide early on in a project if FSC is desirable. The graphic designer must allow enough space for the mark, the printer selected must be FSC certified, and an FSC certified paper needs to be chosen. Also, the process may add up to a day to the print schedule to apply the mark before creating a proof. Sometimes, using the FSC mark is not practical, such as on a business card where space is limited and printing the mark will force printing on the back side at considerable expense (and potential waste of energy and ink). Sometimes, the design is already complete and there is just not enough space. The environmental benefit of printing an FSC piece is the sustainable management and preservation of forests. The marketing benefit is a tangible demonstration of your concern for the environment. Your Hartley Press representative is fully familiar with the FSC program and will guide you through the simple process.